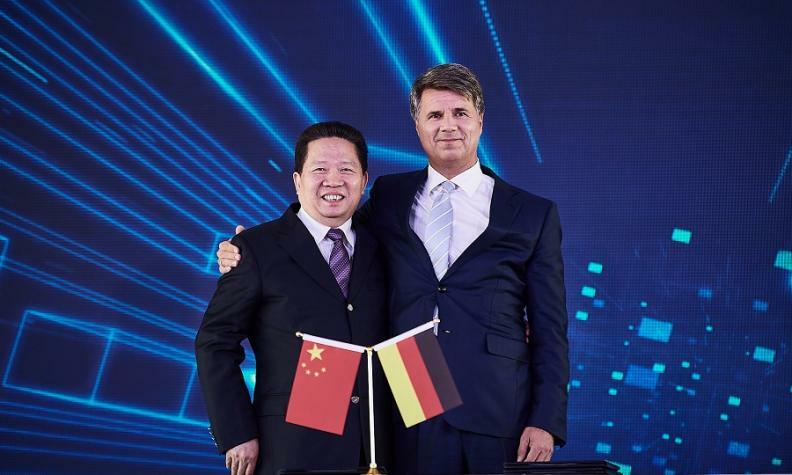 BMW's Krueger with local Communist party secretary Chen Qiufa at a ceremony to mark the strategic contract signing. SHENYANG -- BMW said it will take majority control of its main China joint venture for 3.6 billion euros ($4.2 billion), the first such move by a global automaker as Beijing starts to relax ownership rules for the world's biggest auto market. BMW will lift its stake in its venture with Brilliance China Automotive Holdings to 75 percent from 50 percent, with the deal closing in 2022 when rules capping foreign ownership for all auto ventures are lifted. The move will likely spur BMW to shift more production to China, helping boost profits amid a whipsawing trade war between Washington and Beijing that has raised the cost of BMW importing cars manufactured at its South Carolina plant. The deal also marks a milestone for foreign automakers which have been capped at owning 50 percent of any China venture and have had to share profits with their local partner. "We are now embarking on a new era," BMW CEO Harald Krueger said in a speech in the northeast Chinese city of Shenyang where the joint venture is based. He thanked Chinese Premier Li Keqiang who he said had "personally supported" the plan. Beijing has been keen for global automakers to invest more in China, including easing restrictions that cap foreign ownership of electric vehicles businesses at 50 percent this year. As trade tensions have escalated, China's government has also pledged to open up its markets more widely, including cutting taxes on imported vehicles, cancer medicines and a range of consumer goods. The country's leaders have also played up other milestone deals such as German chemical maker BASF winning approval in July to build China's first wholly foreign-owned chemicals complex. The rule changes have already helped Tesla Inc. gain Beijing's approval for a wholly owned China manufacturing and sales company in Shanghai, marking the first time a foreign automaker will be able to establish a full presence in China without a partner. "Given the trade dispute between the U.S. and China, there is a powerful incentive for automakers to produce vehicles in the market where they sell them," said independent auto industry analyst James Chao. He said control of the joint venture could spur BMW to bring production of models such as the BMW X4, X5 and X6 crossovers, which are currently built in the United States, to China. BMW's Hong Kong-listed partner, Brilliance China, which makes the vast majority of its revenue from BMW-branded cars, has seen its shares tumble nearly 50 percent this year on talk that such a deal was in the offing. The company's shares were suspended on Thursday morning. BMW is one of the biggest exporters of vehicles from the United States to China, putting the automaker firmly in the crosshairs of a trade war which has seen both sides raise tariffs on a multitude of goods, including automobiles. Krueger said the joint venture, BMW Brilliance Automotive, planned to add a new plant at its site in the city, spending over 3 billion euros on a large-scale expansion of the existing production facility. Yale Zhang, head of Shanghai-based consultancy Automotive Foresight, said the move would likely spur other global automakers to push for higher ownership of their China ventures, though it remained to be seen how the new structure would work in practice. "Others will follow over time, but the divorce schedule depends on how strong or capable the local partner is," he said. A number of automakers, including Mercedes-Benz parent Daimler AG and Honda Motor Co. said earlier this year they had no immediate plans to change their China JV structures despite the planned rule changes. In addition to its Brilliance partnership, BMW is also working on a new venture for its Mini brand with China's Great Wall Motor.